One of the major sources of microplastic pollution in the San Francisco Bay comes from something you might not expect: our laundry. Turns out, our clothes shed thousands of fibers every time they're washed. And in our synthetic clothes, those fibers are made of plastic. They slough off of the fleece jackets, athletic clothes, and even jeggings that make life in this land of microclimates a little more comfortable. Microplastics—which are plastic fragments, pellets, and films smaller than 0.2 inches—raise concerns because they become a magnet for the chemicals that linger in our water: pesticides, flame retardants, even the DDT that was banned decades ago. Perhaps the best-known culprit, the plastic microbead found in personal care products, has been banned—first in California and New York, and then federally in an impressively swift time period. But microfibers present a unique threat, and the solution is far less clear. The Regional Monitoring Program for Water Quality in San Francisco Bay tested the effluent of eight wastewater treatment plants last year and found that 80 percent of the microplastics and other microscopic particles were fibers. It is unclear what proportion of these fibers were synthetic or natural—synthetic fibers like polyester or acrylic are categorized as "microplastics" and, like other microplastics, do not break down in the water. But, plastic or not, the microfibers are a cause for concern. Once they enter the water, they can absorb chemicals and might work their way up the food chain. Most of the animals in the water are tiny. They also evolved in a world where they haven’t had to distinguish between a nutritious piece of plankton and a contaminant-laden plastic pellet. These animals mistake small manmade particles for food, potentially allowing contaminants to accumulate as they make their way from the base of the food web to the apex predator: humans. And the fibers are, indeed, working their way into our marine food chain. When UC Davis researchers looked into the guts of fish from a market in Half Moon Bay, they found that 25 percent of the fish were carrying manmade debris; fibers made up 80 percent of this debris. Fibers were also found in one-third of the oysters the researchers studied. 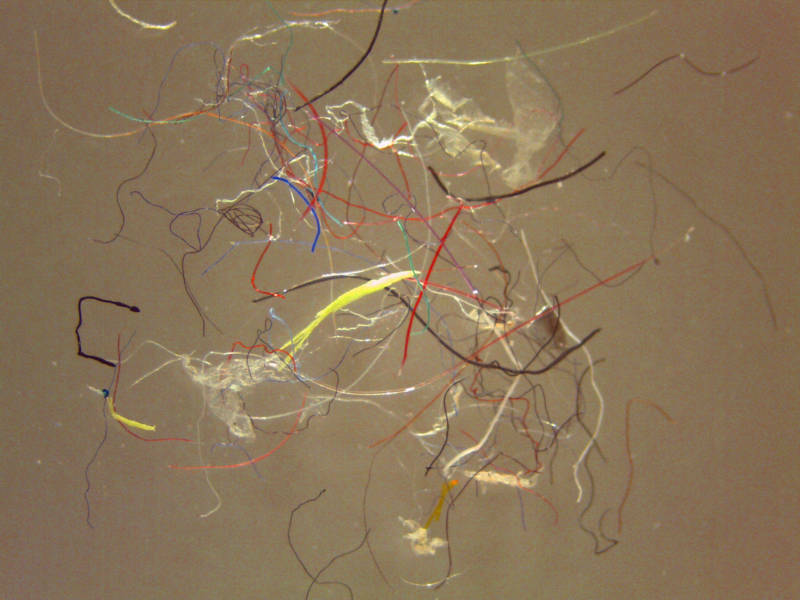 Microfibers are unique among marine debris for two reasons. The first is their shape; most microplastics exist as small spheres or fragments. Think about the large sources of plastic pollution you hear about—the buoys, nets, or fishing lines that entangle sea turtles or whales. Microfibers are essentially the shrunken-down version of this. “So you could say a whale with a big rope isn’t that different from plankton with a small fiber,” Rochman says. The second unique trait of fibers is their history. Clothes are often treated with chemicals throughout the manufacturing process. When their fibers enter our waterways, they attract the water's long-lingering chemicals on top of the chemicals they arrived with. This might sound like a lot for one little thread to handle, but its surface-area-to-mass ratio makes it really good at absorbing things. Where Are These Fibers Coming From? We are tied to synthetic clothing, says Stiv Wilson of the Story of Stuff. 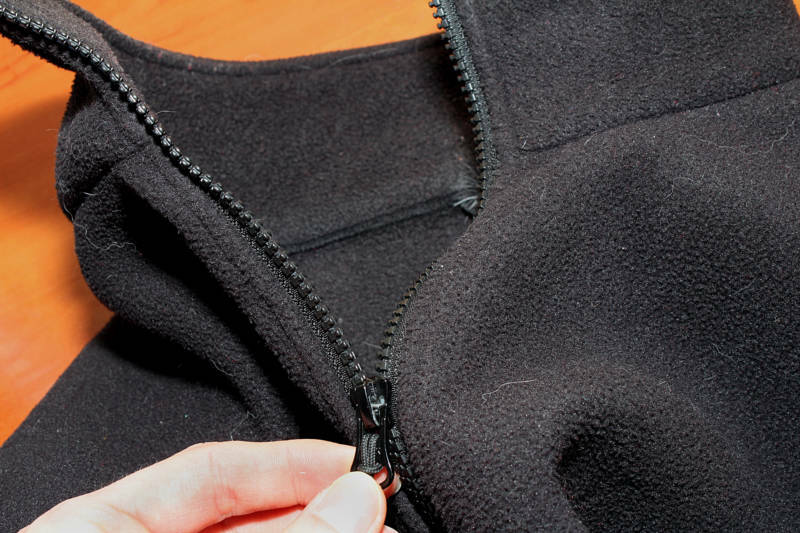 Every time a fleece jacket is washed, it releases hundreds, if not thousands, of fibers. The amount of plastic released by the laundering of 100,000 fleece jackets is equivalent to up to 11,900 plastic grocery bags, according to a study from the UC Santa Barbara Bren School of Environmental Science and Management, commissioned by Patagonia itself earlier this summer. And standard washing machines don’t have filters to catch these fibers. Once they escape from our laundry, the tiny, mobile threads work their way to our wastewater treatment plants. Here is where the journey becomes unclear, and where wastewater treatment agencies are working to learn more. Some of the fibers might be captured by current methods. But this might create a problem in itself, says Wilson, in cases when the solid material that is separated out during treatment gets applied to the land as fertilizers. Patagonia was the first company to take a look at its own manufacturing practices in response to microfiber pollution. After commissioning the UC Santa Barbara study, the company informed its customers about the issue in a blog post last month. One of the results presents an interesting conundrum to the company; Patagonia has encouraged customers to use their items for as long as possible, but older jackets were shown to shed more fibers. The company did find one straightforward solution: front-loading washing machines shed less fibers than top-loading. 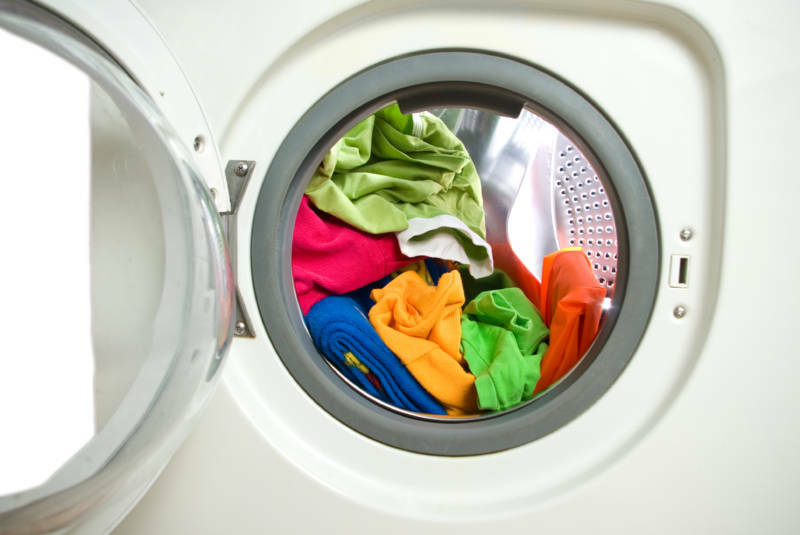 Chelsea Rochman echoed this, recommending that concerned consumers use front-loading machines, wash synthetic clothes less often, and encourage appliance manufacturers to put a filter on washing machines. Bay Area wastewater treatment plants are now focused on understanding the extent of the microfiber loads. "This is a stepwise type of effort to figure out—very importantly—what are the loads, where are the loads coming from, how detrimental are the loads?” says David Williams of the Bay Area Clean Water Agencies (BACWA). We also don't know whether there's an actual risk to humans. The UC Davis study found fibers in oysters, which we eat whole. But the only part of the fish they examined was the digestive system—not a part that Californians generally eat. “Are the toxins leaching out in the gut and getting into the flesh of the fish?" asks Susan Williams, another UC Davis researcher. "And are they getting in in high enough concentrations that they’re a human health risk?" One first step, says David Williams, is to understand just how many of the fibers found in the Bay are, in fact, synthetic. BACWA's lab team has “been working for several months now on developing more robust protocols” in order to make the distinction. Even if it means taking a long, hard look at our layers.